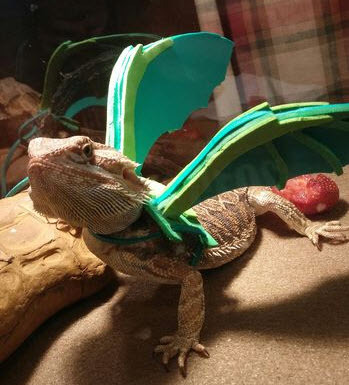 Make a harness for your bearded dragon that has wings! Draw the shapes for the wings and harness on a piece of paper, cut out the shapes, then use the paper templates to cut out the shapes from pieces of craft foam. Use a file to soften the edges on the cut foam and make them look more natural. Glue the cut pieces of foam together to make the wings and the harness saddle, poke two small holes in the harness saddle, and attach the base of the wings in the holes. Make several more small holes on either side of the saddle and attach a string with a sliding clasp through the holes.